Idyllic beaches. Shopping. Famous nightlife. 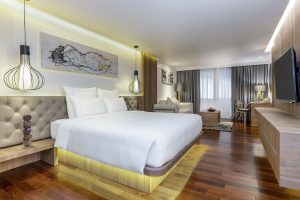 Whether you’re planning a relaxing beach break or a week-long holiday with friends, there’s something for everyone in Patong. Just 200 meters from the hotel, discover the palm-fringed crescent of Patong Beach. Sign up for scuba diving lessons, get a bird’s eye view of the island while parasailing high above the ocean or simply spread out your towel and relax beneath the warm Thai sun. Just south of Patong, scenic Freedom Beach offers a quieter perspective on the island’s coastal beauty. Purchase picnic supplies from our Grab n’ Go café and head there on a romantic date. Inland, opportunities for adventure abound. Ask our concierge for information about tours, activities and golfing – or, if you’re feeling particularly brave, zip-lining. In need of a little retail therapy? 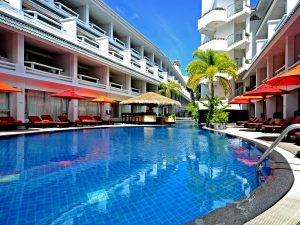 Swissôtel Resort Phuket Patong Beach is a few minutes’ walks from Jungceylon Mall, the premier shopping destination on Phuket. Home to more than 200 stores, families also love the mall’s cinema and bowling alley. In the evening, leave your little ones under the watchful eye of our professional Kids’ World child-minders, and head out for a night on the town. Explore a fantasyland of neon lights, vibrant music and bars overflowing with visitors and locals alike. If you have time, experience the thrill of traditional Muay Thai boxing at Bangla Boxing Stadium. For a well-rounded view of Phuket, plan a day trip to Phuket City. The Old Town reflects the island’s heritage as an important stop on the trade route from India to China. Here, Chinese Taoist temples rub shoulders with elegant Sino-Portuguese mansions. In between, you’ll find a wealth of trendy coffee shops and boutiques, interspersed with street vendors selling Thai staples like Pad Thai and taro pancakes. Other must-see cultural attractions on Phuket include beautiful Buddhist temple Wat Chalong, and the Nakkerd Hills’ 45-meter-high Big Buddha.